Most of the classes and sessions we offer are facilitated on a volunteer basis, by a caring group of professionals who are dedicated to giving back to the community through their own passion for being of service to others and to transform through the power of "tribal community". 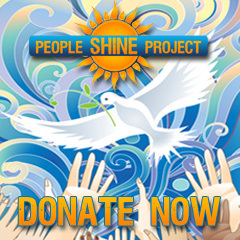 As a result of their generosity and commitment to the community, we are granted the opportunity to make available to the public through the alliance of the People Shine Project an extensive variety of very special services and classes at extremely affordable rates in a centralized location. Currently we have over 20 providers and guides and we have been successfully serving SW Florida since 2008. Our teachers and leaders run the gamut from life coaches, wellness coaches, ministers, spiritual teachers, meditation masters, to shamanic practitioners, energy medicine practitioners (including Reiki, Theta Healing, Feng Shui, sound and crystal healing), prosperity coaches, addiction recovery coaches, massage therapists, ceremonialists, hypnotherapists, plus artists, musicians, yoga and Tai Chi instructors, as well as business and career consultants, and marketing experts. Ordained Clergy, Founder of Divine Circle of Light, All Ministerial Services, Reiki Master, Mathematics Teacher for Lee County at Varsity Lakes Middle School, member of Truth Center for Higher Consciousness and member of Universal Circle of Enlighten Prayer Line.